31 Comments on "Have Questions?" I just found you and I’m so glad I did. I’ve made a few of your recipes and they were wonderful. I happened to read a comment from someone saying how much he liked your pork chops (reverse sear) I couldn’t find him again and couldn’t find any pork chop recipes of yours either. Can you let me know the name of them? I find pork chops are usually tough and so I don’t make them often. That may have been someone else’s website. I don’t cook pork chops for the same reason as you – they always turn out tough. 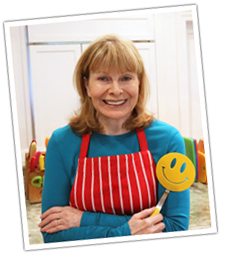 Jenny, would love you to make an avocado brownie recipe to share with us. I enjoy all your recipes! Thank you! no questions, just a comment. i LOVE cottage/shepherd’s pie but am not cook enough to make it. i found some great recipes on line but yours are always so simple and easy to follow i thought i’d see if you had one but, alas, you don’t. if you ever feel the need to make cottage pie and post the recipe, you’d have at least one happy fan but if not, my life will not be ruined, i will continue to live and enjoy life. keep up the good work and don’t let the ‘needy’ get you down; do what you can, when you can and as well as you can and if people want more of you than you can give, that’s their problem, not yours. I totally love your web site and videos, your a real hoot ! I have made so many of your recipes they are all scrumptious ! My favorite are your pierogies and all the Polish recipes . I’m wondering about a Polish dish called haluski and if you have a recipe to share with home made noodles ? Thank you again Jenny hope you have a great day ! Sorry, I have no recipe for haluski….. yet! I loved loved loved all your recipe. when I have more time, I am going to try all of them. I have enjoyed the ones I made so far. My question is, do you have a recipe for red cabbage? I had red cabbage with Kielbasa at a German restaurant, it was the best one I’ve eaten. Jenny , please tell me if I want to double the recipe of you wonderful recipe of white cake with oil , what I should do? I put double the countity and it didn’t work. Doubling a recipe can be tricky when baking and I have never doubled this cake so I’m sorry but I am not able to advise. You might be able to research it online. I am sure you won’t offend if you can’t address every single query; do your best and remember you are doing this for fun–The Jenny Jones Show has long been canceled!! I viewed your Youtube channel by chance back in 2014 and have been making at least one of your recipes each weekend since then. And they have all turned out wonderfully (except for your granola bars, which I can’t seem to master no matter how many times I try). This from someone who spent the better part of their week eating out of cans. Hi Jenny, Thank you so much for all that you have done. I have been making your recipes now for the last couple of years and everything I make always comes out wonderfully. Most important I have learned to cook and bake without butter and this is all because of you. What I want to say to new visitors to your site is to follow your easy recipes exactly and they will never have a problem. Thank you again. Please do sourdough!! Im so confused, biga, poolish, starter…. You make everything look so easy! Can you tackle sourdough! Jenny you are so special. I hope you know the awsome and special person you are, I like your videos so much . I just discovered you some days ago and I already did your cinnamon roll yesterday night ( oh so yummy!, that recipe is in this family to stay.) Already got the salmon to do the patties and am looking forward to do the bread and step by step try all your recipe, ( I hope so). Please don’t worry sit and relax, we are enjoying a lot what you do. And your videos are excellent and funny. You always make me laugh. At the end of my day I have a new routine…explore your blog, recipe and view your videos. I have stop seeing my series to view your videos. Remember to take time to smell the flowers, well if it’s not winter where you are. Blessings and hugs from the tropical caribbean island of Puerto Rico. Love your cooking video’s on you tube. Please do more of these. Jenny, I love your site! I was searching for Packsi when i found you. I returned this morning and found that I have been on here for 3.5 hours, it is so interesting. It is so friendly and down to earth, I even love to read all of the comments. I truly love it, and will return often! I do the same…read others people comment. You learn more about the recipe with the interaction in comments of your followers. Jenny..are you going to do any more videos??? I don’t know… probably not. I promise you, that if u shopped it around to a network somewhere, if u ever had the inclination, the public would love to see u do a cooking show on tv! Thank you for saying that but I have no desire to be back on TV and have declined all offers that have come my way. That proves it “You are a very smart lady”! I am sure that with everyone else in control and the pressure you would be under, at having a TV food show. I love you just the way you are relaxed! God bless you and please keep your site going, for all of us that enjoy it so much! I so agree with you Patti!!! Jenny, you are awesome! Please don’t let it all stress you. I appreciate your recipes more than I can say. Do what you can, let go of the rest. No one wants you burnt out! Jenny, thank you for this website! I really enjoy cooking and baking with your recipes and videos!